VIEW SOUTHSIDE SPIRIT HOUSE 360 HERE. Centrally Located within 1.5 blocks from MOSCONE CENTER, The W Hotel and Yurba Buena Center, Southside Spirit House is the perfect meeting spot for your event. There is free street parking after 6pm and many lots on Howard Street and in between 1st and 2nd on Howard. 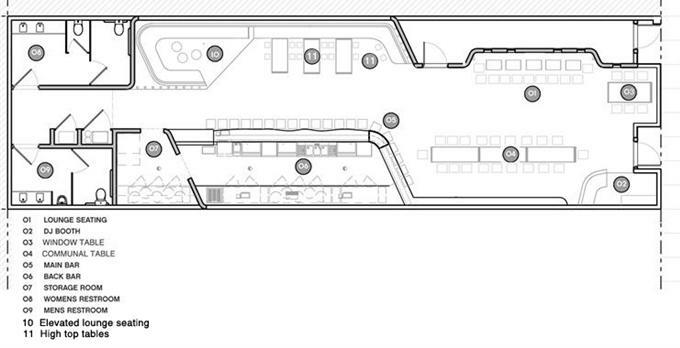 2,000 square feet of indoor event space; 3 wells; banquette seating, lounge seating and high top communal table. 3.5 individual stall bathrooms..
Southside has a kitchen capable of providing you with in-house catering or you may bring in your own choice of catering. Corporate functions, social functions, product launches, press conferences, VIP/executive hosting AND MORE. Southside Spirit House is also perfect for clients wishing to host events in conjunction with conferences at Moscone Center located only a block and a half away. State of the art DJ equipment and sound system, microphone. Southside Spirit House is a 21+ establishment. No persons under 21 years old are allowed at anytime. No PETS, please.